To keep up with the latest trends you have to know about the latest tools for the best development practices. And we do talk not only about programming but about the design also. Syndicode is proud of our UI/UX design skills and products. That is why we need to provide the constant improvement with new tools and technologies, methods and approaches. Today we will show you the new UI kit for designing card-based interfaces and media websites. 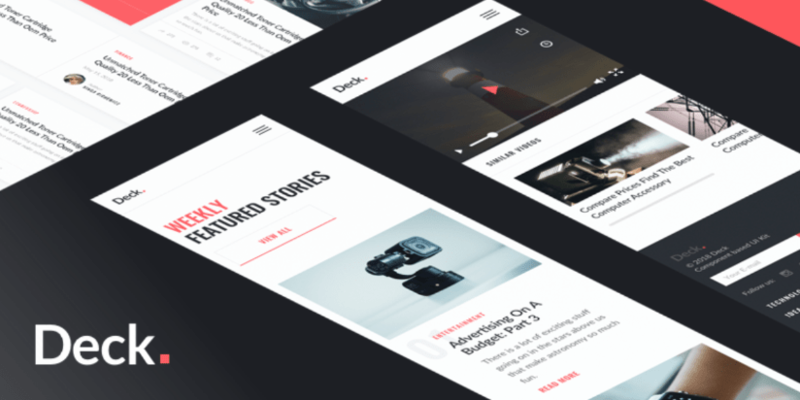 Meet Deck – a beautiful cross-platform UI kit by InVision! Most of you probably heard of or even used InVision, a product design collaboration platform we wrote about when named the best user research tools for 2018. These days InVision released the new product called Deck. This is a free UI kit tailor-made for desktop, mobile, and tablet formats, so your site design will be looking good on any device. Vector-only shapes scale to any size, including retina, with no optimization required. Deck was designed with a custom 12-column, 1360px grid, to help designers maximize the available space on each page. And the free card UI kit comes with two sophisticated web fonts for easy editing. Great, isn’t it? More features and options of Deck you can find here.